Whoever Albert Nobbs is, I’m still wondering. 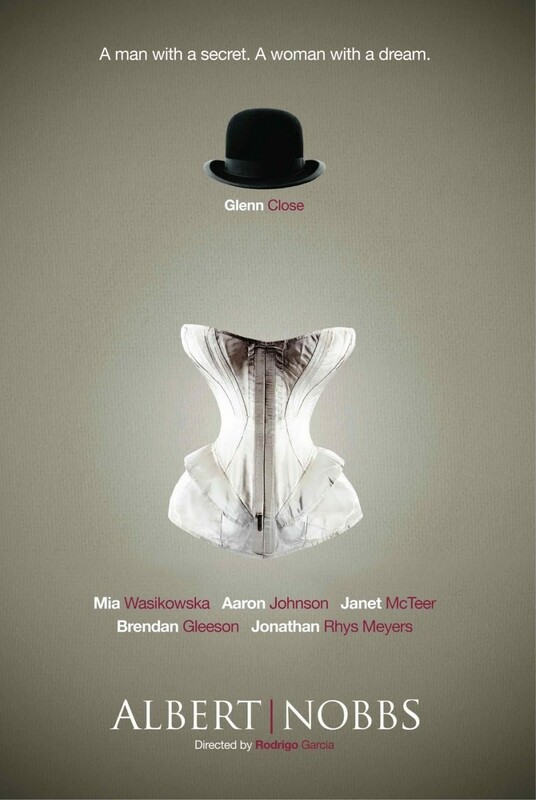 Our title character (Glenn Close) is a woman posing as a man, working as a butler in a hotel in Dublin, circa late 1800s. She is living an anonymous and simple life, saving money, presumably to escape her station. This humble plan is disturbed when a full hotel forces her to share her bed with a male painter, Hubert. Hubert discovers Albert’s secret, but turns out to be living a similar lie. Hubert (Janet McTeer) becomes a small kind of confidant for Albert. She lives with a wife and has an outwardly normal life, worlds away from Albert’s extreme withdrawal. It is tragic that the catalyst for Albert’s downfall should be a kind of hope, but it’s hard to escape the conclusion that in seeing and trying to emulate Hubert’s relationship Albert reaches for a life she had never believed she could have. It is easy to believe: Hubert is an alluring figure, Janet McTeer easily the most compelling presence in the film. Albert embarks on a chaste, nearly inexplicable courting of the young hotel maid Helen (Mia Wasikowska) as – what? Albert tells her that she wants Helen to live with her, run the tobacco shop she has scouted out and saved money for, be a family. But what is Albert looking for? The question of her emotional desires or sexuality is never addressed. She wonders openly about Hubert’s life with his wife behind closed doors, but she pursues that life without ever seeming really to understand it, perhaps again doing little more than play a part. While Hubert is certainly sympathetic toward Albert, she has a kind of leering astonishment that I thought suggested that she shares our view of Albert as a repressed naïf. Sadly, beyond a single scene in which Albert sketches her past for Hubert, she and we see a character made trivial and forgettable by her debilitating guardedness. Throughout the film we see frustratingly little of Albert beyond that she is saturated with fear. But why? Whose fate is she trying to avoid? The film gives us little notion of the world that Albert would face as a woman, which has the unfortunate consequence of making her fear seem almost unintelligent. A charitable view would be that Albert’s life-spanning secret has buried mature emotion and left her stunted, but I found it difficult to work up any sympathy in that direction without at least some help from the film in understanding Albert a little better. And so decisions by Albert that should be infused with meaning become perplexing, and it becomes too tempting to see her as inexcusably simple-minded. The effect is made much, much worse by the bizarre decision to occasionally have Albert, when alone, narrate her actions as if to a child: counting her money, for example, she methodically itemizes her coins and relates – presumably for us – her progress towards her goal. The movie is adapted from a play, and Close’s wide-eyed wonder when she talks to herself would perhaps play well on stage but on screen seems jarring. Along similar lines, when Albert fantasizes about how the for-lease storefront might turn into her shop, we see a Disneyesque daydream, all gold-tinted soft focus and cloying music. Of course we need to understand what Albert wants to achieve, but the film never seems to work out a way to display this in a way that respects Albert’s intelligence. Perhaps we are supposed to see Albert as a tragic case of arrested development, her simplicity, asexuality and confusion the product of a life lived in secret and without the oxygen of human relationships. Then her contrast with the pragmatic and assertive Hubert would recast her whole history as a horrible half-life. But in practice the contrast favors Hubert too much, and Albert becomes so much of a challenge as to be easy to dismiss. Maybe that is Albert’s true tragedy, but it is a difficult one to hang a whole film on.